One of the most important hypotheses in the field of biblical scholarship today is the Q hypothesis. The Q hypothesis seeks to explain the textual similarities that are unique to Matthew and Luke (known as the double-tradition material), by positing that a now lost document (or collection of documents) is the source of the material that is uniquely shared between Matthew and Luke. Essentially the hypothesis proposes that Matthew and Luke both copied from the Gospel of Mark and also independently made use of a separate document that contained “original” or “early” information about Jesus, primarily sayings. I must first note that while I personally do not believe that any such Q document ever existed, the “mythicist position” is not dependent on the rejection of the Q hypothesis. Several well-known mythicists currently do hold, or have in the past held, positions that accept the Q hypothesis, such as Earl Doherty and Robert M. Price. Deciphering the Gospels Proves Jesus Never Existed contains a case against Q in chapter 6. In Deciphering the Gospels I propose an explanation for the double-tradition material that involves the existence of a now lost intermediate longer version of Mark that both Matthew and Luke copied from. However, when I wrote Deciphering the Gospels I had not yet read Mark Goodacre’s The Case Against Q. Having since read Goodacre’s work and studied the issue more thoroughly, I now accept Goodacre’s explanation for the double-tradition material, known as the Farrer hypothesis. The Farrer hypothesis essentially proposes that the author of Luke copied from both Mark and Matthew. Nevertheless, the case against Q that I put forward in Deciphering the Gospels still holds, it’s just that the solution to the problem that I put forward in Deciphering the Gospel is, I now believe, less likely than the Farrer hypothesis. In fact, my current view goes beyond the Farrer hypothesis to incorporate information from David Oliver Smith’s book, Matthew, Mark, Luke and Paul, to propose that the author of Luke was using not just Mark and Matthew, but also Paul’s letters when he wrote his Gospel. Because my current position is not properly represented in Deciphering the Gospels I will lay that out here. First let’s start with some of the major problems regarding the treatment of the Q hypothesis. Anyone familiar with biblical scholarship knows that Q is treated by many scholars not just as a fact, but as “the earliest record of Jesus.” This is one of the major problems with how Q is used in biblical scholarship, because even if one does suppose that the best explanation for the double-tradition material is that it comes from a separate document that both Matthew and Luke used, there is nothing to support the idea that such a document was an early record of the authentic sayings of Jesus. This is indeed the biggest fallacy in relation to Q. Not only do many scholars just assume that Q is the valid explanation for the double-tradition material, they then take the second extra leap of assuming that whatever Q is, it represents the earliest writings produced about Jesus. Let’s be clear, even if the independent use of a separate document is considered the best explanation for the double-tradition material, there is absolutely no evidence that such a document is some early source. Indeed, there is significant evidence showing that the Q material was all developed after the writing of the Gospel of Mark (this is reviewed in Deciphering the Gospels). So the Q hypothesis is really twofold. It first proposes that Matthew and Luke both independently incorporated a second source document with the narrative from Mark, and then also makes the leap that if they did so, then the document that they used is, “the earliest record of Jesus’ teachings.” The first part of this proposition is reasonable, the second part, however, is completely unsupportable. Yet, it is easy to see why so many biblical scholars take this position. Below I have produced a graph of the major early documents of the New Testament and ordered them in roughly the sequence that I believe they were written. 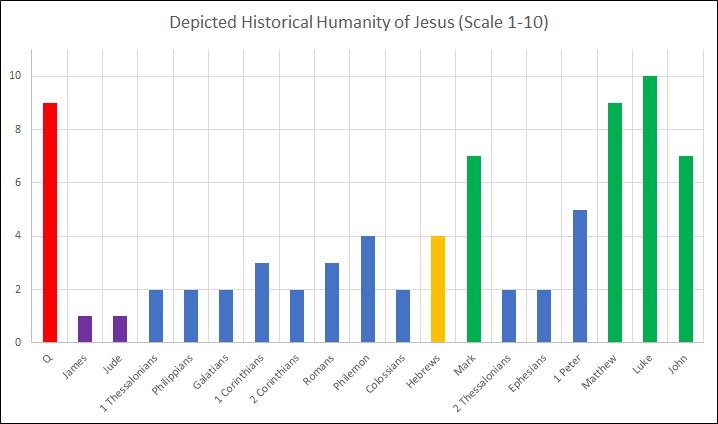 I have also given each document a ranking from 1 to 10 in the degree to which they depict Jesus as a real historical person, with 1 being the least historical and 10 being the most. I have put Q at the front of the chronology, where Q theorists believe it should be. What we can see from this is both why so many scholars want to believe that Q is the earliest record of Jesus and why it is actually so unlikely to be. What we see in the evidence is a general progression of increasingly human depiction of Jesus over time, with Luke being the pinnacle of the historicizing effect. Clearly the Gospels of Matthew and Luke present the most humanized and historicized version of Jesus. Q is essentially a subset of the texts of Matthew and Luke, so by pulling from the two most historicized accounts of Jesus, of course what we are left with is a “document” that provides a very humanized depiction of Jesus. What most biblical scholars do is they use the fact that “Q” provides a humanized version of Jesus as the basis for the claim that Q is the earliest account of Jesus, because they assume that, “since Jesus was a real person,” the earliest accounts of him would depict him as a “mere person.” Since the double-tradition material is mostly sayings, of course what we are left with is a “document” that provides a relatively humanized account of Jesus. So the circular logic kicks in. They start with the assumption that a humanized depiction of Jesus would represent a “non-mythologized”, and thus early, account of Jesus, and then use the fact that the double-tradition material lacks major supernatural elements to conclude that it then “must be early” – an account from “prior to” the mythologizing of Jesus. But these are of course all just assumptions of circular logic. What if the humanizing of Jesus is itself the product of mythologizing? That is, indeed, exactly what the data suggests. What we see in the real documentary evidence is a progression of humanization. It is only the hypothetical document Q that stands out and breaks the trend. It is the fact that Q can be theorized to break the trend that makes it appealing to biblical scholars, because it’s not something real that can ever actually be tested or verified. It allows them to just use this assumption as a basis for their model without ever having to actually prove it. For more detail on those points visit the links to Prof Goodacre’s site. I want to touch on point number 2 in particular, which also relates to point number 4. If Q is what so many scholars assume it is – the earliest account of Jesus, then Q would had to have existed as a collection of documents for somewhere between 40 and 90 years without anyone making reference to it, then both Matthew and Luke would had to have independently gotten possession of copies of it, they would then had to have both integrated it into the Markan narrative in exactly the same way across dozens of scenes, and then they would both had to have lost all of the Q material such that it completely disappeared from the historical record. Note that there are not even any accounts from early Christian scholars of the second through fourth century that give any hint of the existence of Q. This would mean that, essentially, the most important document(s) of Christianity went unreferenced by all but two people, and both of those people lost their copies of the most important document(s) of Christianity. Think about just how unlikely that is. Now compare that to the proposal that the author of Luke, who says explicitly in his opening that he is making use of multiple accounts of Jesus that were produced before him, was working from copies of Mark, Matthew and Paul, and that Luke understood the precedence of these works, giving priority to Paul over Mark and Mark over Matthew. That’s really all that is required to explain the double-tradition (and a bit more). Now see point number 4. The main argument against the proposal that Luke used both Mark and Matthew (as opposed to Mark and Q) is the claim that Matthew is such a beautifully composed work that one can’t imagine why someone would revert some portions of Matthew back to a more Markan form. Essentially, in the Gospel of Luke some portions of the double-tradition material are more closely aligned to the Markan narrative than they are to how they were recorded in Matthew. But if Luke considered Mark more authoritative than Matthew then this all makes sense. The proposal that Luke considered Mark more authoritative than Matthew also makes perfect sense. But this is where the work from David Oliver Smith on Luke’s use of Paul comes into play, because it provides further confirmation that Luke was a discerning editor who understood the precedence of the pieces he was working with and gave priority to what he considered to be more authoritative works. We can see this because Luke does the same thing in cases where there is overlap between Mark and Paul. In other words, in cases where there is overlap between Mark and Matthew Luke often chooses Mark as the source to follow. (This is why the Q hypothesis was proposed, to explain why Luke didn’t just follow Matthew.) But it is also the case that when there is overlap between Mark and Paul that Luke often chooses Paul! This shows that Luke had all of these works in-hand and was working from them and making conscious choices based on his understanding of the priority of these works. This is a framework that has tremendous explanatory power for understanding Luke. This gives us an understanding of Luke as a discerning researcher and composer, as opposed to some mere scribe who was just blindly integrating documents, as the Q hypothesis proposes. But, of course, it also tells us that Luke is just borrowing from other material that we already know the provenance of, which is why so many biblical scholars don’t like this explanation. So now let’s review some additional evidence to support this position. I’m not going to repeat the case that has been laid out by Prof. Goodacre. For that evidence please see Mark Goodacre’s book, The Case Against Q. As we can see, both of these passages share elements with the narrative from Mark, while also containing elements that are shared between each other but not shared with Mark. Beyond this, David Oliver Smith shows that much of the double-tradition material is actually best explained as having itself been based on the letters of Paul and Hebrews. Smith provides a multitude of examples to show that the double-tradition material is closely aligned with passages from the Pauline letters and Hebrews. Again, I’m not going to repeat Smith’s work here, but I highly recommend his book, Matthew, Mark, Luke and Paul: The Influence of the Epistles on the Synoptic Gospels. This, then, provides further explanation for other aspects of Gospel data. For example, this also helps us explain the Eucharist passages in Paul and the Gospels. In Deciphering the Gospels I show that the Last Supper scene in Mark is derived from the Eucharist passage from Paul in 1 Corinthians. We now reach perhaps the single most important parallel between the Gospel called Mark and the letters of Paul—the Eucharist. 23 For I received from the Lord what I also handed on to you, that the Lord Jesus on the night when he was betrayed took a loaf of bread, 24 and when he had given thanks, he broke it and said, ‘This is my body that is for you. Do this in remembrance of me.’ 25 In the same way he took the cup also, after supper, saying, ‘This cup is the new covenant in my blood. Do this, as often as you drink it, in remembrance of me.’ 26 For as often as you eat this bread and drink the cup, you proclaim the Lord’s death until he comes. In Deciphering the Gospels I go on to explain that the word “betrayed” is a common but improper translation of the Greek, which is more properly translated as “delivered up”, or, in other words, sacrificed. What Paul is really stating in 1 Corinthians is that this Eucharist ritual came to him via revelation. As such, Paul presents himself as the originator of the ritual. 19 Then he took a loaf of bread, and when he had given thanks, he broke it and gave it to them, saying, “This is my body, which is given for you. Do this in remembrance of me.” 20 And he did the same with the cup after supper, saying, “This cup that is poured out for you is the new covenant in my blood. 21 But see, the one who betrays me is with me, and his hand is on the table. 22 For the Son of Man is going as it has been determined, but woe to that one by whom he is betrayed!” 23 Then they began to ask one another which one of them it could be who would do this. Many biblical scholars point to this as evidence that Luke and Paul were both independent witnesses to the same tradition – both independently recording the same information. But a much more likely explanation is that Luke was merely referring back to Paul. We know that Luke was using Paul’s letters, as the same person who wrote Luke also wrote Acts of the Apostles, which is largely about Paul and makes abundant use of Paul’s letters. What we see here from Bauckham is a typical example of the type of rational used by mainstream biblical scholars. Bauckham states that literary dependence in either direction is unlikely. Why? In fact Luke’s literary dependence on Paul should be seen as highly likely from the outset, given that we know Paul’s letters were written before the Gospel of Luke was written. That should be the very first assumption that is checked. But instead of doing the work to determine if Luke made use of Paul’s letters (he did), Bauckham, like most biblical scholars, dismisses this possibility right out of the gate because it conveniently leads him to his prior point. Since Bauckham assumes that Luke couldn’t possibly have used Paul, it then “must mean” that the similarity between Luke and Paul is the product of both of them having used “a common source.” And if they both used a common source then of course this ritual existed prior to its transmission by Paul. This is exactly how these faulty assumptions lead to major misunderstandings of the data. This is the exact same type of faulty logic that leads to the imagined existence of Q. What we find in mainstream biblical scholarship is a major bias against the recognition of literary dependencies within the extant texts. So what we see in mainstream biblical scholarship is a major reliance on imagined “lost sources” to explain the similarities between texts. As we see here, biblical scholarship is full of imagined lost sources, both oral and written, used to explain the commonalities across the texts of the New Testament. Yet in reality, virtually all of these relations are far better explained as dependencies among the extant texts. The problem with recognizing dependencies among the extant texts, however, is that everyone recognizes that none of the extant material comes from direct witnesses to Jesus. It is recognized that none of the extant material represents primary sources, and thus imagined potential primary sources are the favored explanation for textual similarities. Thus, what we see in mainstream biblical scholarship is that not only do biblical scholars jump to the conclusion that textual similarities must be the product of the use of a common lost source, but also that the lost source itself is likely an “original” primary source. This is the rational behind Q, and the rational behind claims like those that we see Bauckham making here. But in reality, Luke’s Eucharist provides another example of Luke assigning priority to his sources and showing preference for the sources that he believes are more authoritative. Luke treats Paul as more authoritative than Mark and Mark as more authoritative than Matthew. 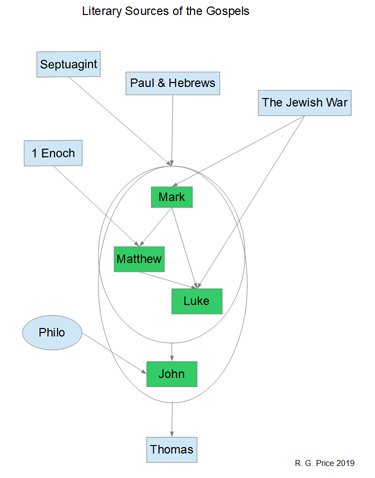 This explains why Luke follows Mark’s narrative sequence more closely than Matthew and sometimes agrees with Mark over Matthew, and also why Luke contains passages that closely follow Paul. In multiple cases where Mark contains scenes that are based on the letters of Paul, Luke recognizes this fact and then draws directly from Paul, as in the Eucharist example. So this entire model has tremendous explanatory power. The model is that Paul invents many elements of tradition himself via “revelation”. The Gospel of Mark is derived from the letters of Paul, with the Jesus character being based on Paul, and Jesus’ teachings being derived from Paul’s teachings. The Gospel of Matthew is copied from Mark, with additions derived from the letters of Paul and Hebrews, as well as the Jewish scriptures. Luke comes along and studies Mark, Matthew and Paul, and then writes his Gospel, which is his construction of what he believes to be the most authoritative amalgam of those sources. Luke confirms Mark’s use of Paul, making it clear to us that he knew that Mark had used Paul’s letters and also that Matthew had used Mark. Luke then, where he recognizes such overlap, defers to what he believes is the most authoritative source and thus builds a version of the Gospel narrative that goes back as often as possible to the “root sources”. Those root sources are Paul and Mark. Luke really only relies on Matthew when there is no other material to go on. Luke assigns the least credibility to Matthew, which is why Luke has no problem not closely following Matthew’s birth narrative, only loosely following it. Nevertheless, Luke’s birth narrative is informed by Matthew’s narrative, but since Luke doesn’t consider Matthew authoritative the way he does Paul and Mark, he has no problem tweaking and diverging from Matthew’s birth narrative. This understanding makes Luke extremely important, because Luke then serves as our earliest survey of early Christian literature. What we know from this understanding of Luke is that Luke was acting as a researcher, who was combing through all of the material about Jesus he could find. This matches the expectation set for us by Luke’s opening, where the writer informs us that he is indeed a researcher who has combed through the prior accounts of Jesus and is compiling an authoritative volume. That’s what Luke says he was doing, and the evidence supports his claim. But what the evidence shows is that essentially everything in Luke can be explained as having been sourced from Matthew, Mark, and the known epistles. What this tells us is that there is no other material. The fact that Luke had to rely on Matthew, Mark and the epistles means that there weren’t a bunch of other sources out there floating around. Luke has confirmed for us that we do indeed have the bulk of the documents of early Christianity in our possession. The fact that Luke relies so heavily on the Markan narrative also tells us that there were not any other competing narratives out there. And of course, what I show in Deciphering the Gospels is that the Gospel of Mark is a pure literary invention, with no basis in real history. So the fact that Luke had to rely on Mark tells us that there was no Jesus narrative at all prior to the writing of Mark. And Luke’s use of Paul again tells us that there was no other source for Jesus sayings. When Luke went in search of the “authentic words of Jesus” he ended up using the words of Paul because that was the closest he could get. So in Luke what we have is a late-first-century researcher who confirms that there were no “original sources” of information about Jesus to be had. As we can see, the case against Q is significant. Q is certainly not the most parsimonious explanation for the evidence. Indeed, the Q hypothesis presents us with an extremely unlikely explanation for what is much more simply explained by the Farrer hypothesis. The idea that some separate older document went unmentioned by anyone, was then obtained by two people, then independently integrated with another narrative in the same way dozens of times, only to disappear from the record again, is extremely unlikely to say the least. Q is the ultimate Rube Goldberg device of biblical scholarship. The fact that it is so widely adopted tells us far more about the state of biblical scholarship than it does about the plausibility of the proposal. Q appeals to biblical scholars because the vast majority of biblical scholars want to believe that the Gospels contain records of “original sayings” of Jesus, and Q is the mechanism that allows that belief to continue exist. But the fact is that the double-tradition material is far better explained as the product of Luke having used both Mark and Matthew, while giving priority to Mark as the more authoritative source. Copyright © 2018Decipheringthe Gospels Proves Jesus Never Existed - All Rights Reserved.